Oh what a march it was, and we are continuing to march on! 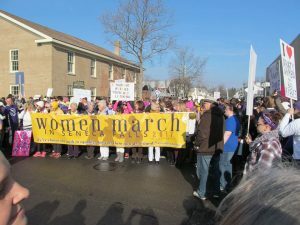 Since hosting 10,000 marchers in Seneca Falls on January 21, Women March in Seneca Falls organizers met to determine immediate, short and longer term “calls to action” to fulfill their mission. Spokesperson, Melina Carnicelli, said, “The organizing group meets regularly as a whole and in smaller work teams to carry out our goals, and to support various local and national activist groups. We are committed to continuous vigilance around issues of deep political concern affecting women’s rights and all human rights. We marched again in 2018 with an estimated group of 15,000, and are currently planning our Women March in Seneca Falls2019 March and Rally.